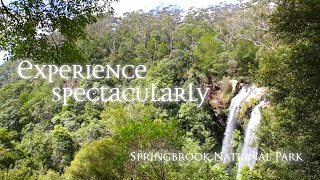 Discover beauty, mystery and history along the 54 kilometre Gold Coast Hinterland Great Walk linking the species-rich Gondwana Rainforests of Australia World Heritage Area of Lamington and Springbrook plateaus via the scenic Numinbah Valley. This World Heritage Area protects the most extensive areas of subtropical rainforest in the world, large areas of warm temperate rainforest and nearly all of Australia's remaining Antarctic beech cool temperate rainforest. Walk through the ancient volcanic landscape of the Tweed Volcano, which is still being eroded by rushing streams and plummeting waterfalls, and through lush rainforest with relicts of Gondwana flora and fauna. The walk offers once-in-a-lifetime experiences—where else in Queensland can you walk along the rim of an ancient volcano? The Great Walk passes through Woonoongoora, the place known to the Yugambeh as seen of the Mountains', whose story tells of the formation of the rivers and valleys of this area. Today's Yugambeh people are descendants of the traditional Aboriginal people whose ancestors walked this land a long, long time ago. They say to you now … 'Kulli bugoram dhagun—nya nya yahngahla' (This (is) special land—walk carefully). The Great Walk passes through Woonoongoora, the place known to the Yugambeh as 'Queen of the Mountains', whose story tells of the formation of the rivers and valleys of this area.